President Moon Jae-in will pay state visits this week to India and Singapore, the key nations for cooperation under the New Southern Policy. Considering the fact that Moon will be accompanied by a large economic delegation composed of management specialists, and that he will be visiting Samsung Group's business site for the first time since taking office, his trip is widely believed to be aimed at advancing his New Southern Policy, which seeks to boost Seoul's diplomatic and economic ties with its Asian neighbors. The presidential office Cheong Wa Dae said that Moon's visit to India and Singapore is meant to gain a foothold for his New Southern Policy to secure new growth engines through economic cooperation with Asian countries. "Both India and Singapore are key partners in the New Southern Policy, one of the key initiatives of the Moon Jae-in administration," Kim Hyun-chul, presidential secretary for the economy, said on July 5. "The upcoming visit will provide a chance for Seoul to carry out its New Southern Policy in full swing, and further accelerate the initiative," said the presidential secretary. Both India and Singapore have a high level of advanced science technologies and excellent human resources. If these are combined harmoniously with South Korea's applied technologies, commercialization skills, and experience of economic development, the two countries could become important cooperation partners in producing growth engines for future economic growth. President Moon embarked for New Delhi Sunday with first lady Kim Jung-sook for his four-day state visit, the first of its kind since taking office. On the second day of his visit, Moon will attend a joint business forum and ask entrepreneurs to play a role and make contributions for the development of partnership between the two countries in his keynote address. The president is also scheduled to attend the opening ceremony of a new $650 million smartphone plant of Samsung Electronics, currently the largest smartphone supplier in India, to encourage employees. Samsung Electronics Vice Chairman Lee Jae-yong will be attending the ceremony as well. On the third day of his India visit, Moon will hold a summit with Indian Prime Minister Narendra Modi. 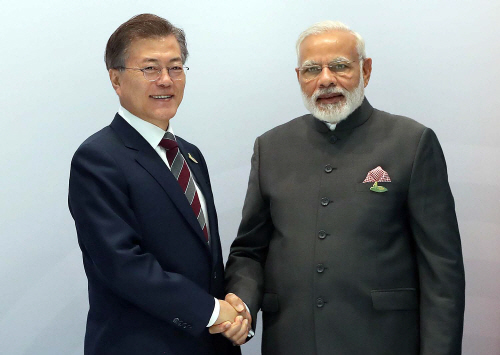 The two leaders will address India-Republic of Korea CEOs round table, and sign a few memorandum of understandings (MoUs) to strengthen economic ties. Moon will then make a state visit to Singapore from July 11 to 13 to continue his economic diplomacy. On the second day of his Singapore visit, the president will hold a summit with Singaporean Prime Minister Lee Hsien Loong, and attend a joint business forum, where he will be delivering the keynote address. On the final day of his trip, Moon will give a lecture titled "Singapore Lecture" to 400 opinion leaders in Singapore to provide details of the New Southern Policy and discuss ways to enable future-oriented cooperation between Korea and ASEAN countries. "In his lecture, President Moon will explain that the peace and prosperity of the Korean Peninsula is connected to the peace and prosperity of ASEAN, and focus on how the New Southern Policy is related with New Korean Peninsula Economic Map," a senior Cheong Wa Dae official said.